CLEMSON – Clemson fans have gone from the agony of the open week and 14 days in between games to this week’s Thursday night game in Winston-Salem against Wake Forest, a span of just five short days since the Tigers beat Virginia Tech last Saturday. Wake Forest head coach Jim Grobe is just 3-8 all-time against Clemson, but all three of those wins have come at home at Groves Stadium. The Tigers have won three in a row in the series, but the last win by the Demon Deacons over the Tigers was on – you guessed it – a Thursday night four years ago when Wake beat Clemson 12-7 and ended the tenure of then-head coach Tommy Bowden. The Demon Deacons are actually 2-0 in home Thursday night games, and 3-1 overall, so they have a bit of a mental advantage in this one. What will happen? Let’s take a look. The Clemson offense scuffled at times last week against the Hokies, and there was plenty of blame to go around – the offensive line struggled in both the running game and pass protection, wide receivers dropped the ball and quarterback Tajh Boyd looked out of synch from the first play of the game. Despite the offensive woes, the Tigers still scored 31 points on offense – seven points were scored on a pick-six – and Sammy Watkins had eight catches as offensive coordinator Chad Morris tries to get the Tigers’ All-American back into the flow of the offense. This week, the Tigers get a Wake Forest defensive unit that has struggled at points this season. 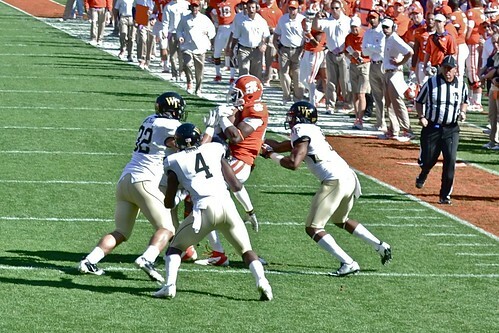 Let’s be honest – this Wake Forest team isn’t the same kind of team that beat Clemson four years ago. There is a reason that the Deacons have struggled to stay around .500 over the past few seasons, and the reason is they don’t have the players like Aaron Curry anymore. The Tigers, however, have plenty of good players. The defense played better last week – getting more of a pass rush and setting the edge in the running game – and the special teams had maybe their best game of the year. If the offense finds just a little bit of a spark, it could get ugly quick. Bad news came out of Clemson this week concerning the defensive secondary. An already reed-thin unit became even thinner when cornerback Darius Robinson fractured an ankle against Virginia Tech and had to have surgery on Tuesday. The other starting cornerback, Bashaud Breeland, suffered an abdominal strain against the Hokies and didn’t even make the trip to Winston-Salem. As a result, the Tigers will have Xavier Brewer at one corner spot [he started the season at safety], while Garry Peters will man the other side [he started the season on the bench]. The third corner will have to be redshirt freshman Cortez Davis, who has seen the majority of his time on special teams. Wake Forest has a lot of emotion and history on its side in this game, and there is no doubt that this one might be closer than a lot of people think. However, Dabo Swinney has done an excellent job of changing the culture at Clemson and getting the players to realize the importance of each and every game. This one will be no different. The Deacons will come out swinging early and gain some momentum, but once the players settle in, it will be more about the Jimmies and the Joes than the x’s and the o’s – and Clemson’s Jimmies are just better than Wake’s Joes.